The 2016 presidential primary schedule is more crowded than ever: At least one primary will be held in 41 states, as well as in the District of Columbia, Puerto Rico and Guam, and another among overseas Democrats – a calendar that cements the primary’s dominance over the older caucus system. And while campaigning seems to start earlier and earlier each cycle (Sen. Ted Cruz kicked things off almost a year ago, announcing his candidacy on March 23, 2015), the actual voting part is coming a bit later in the year than it used to: As recently as 2008, more than half of both parties’ primaries and caucuses had been held by early February; this year, the halfway point won’t be reached till March 15. Democrats will vote in a record 41 state and territorial primaries this year, four more than in 2008, the last year there was a wide-open nomination contest. (Guam calls its vote a caucus, but it operates more like a party-run primary.) Republicans will hold a total of 39 primaries, the same as in 2008 and one fewer than in 2012. Of the 41 states scheduled to hold at least one major-party primary (up from 40 in 2008), 35 will hold both Republican and Democratic primaries, though not necessarily on the same day. The current system, such as it is, has evolved over more than four decades. Up to the early 1970s, ordinary voters had relatively little input into the parties’ presidential nominations: The nominees were chosen at the big national conventions, and most convention delegates were chosen by caucuses, local conventions, state committees or other forums dominated by party insiders and political professionals. 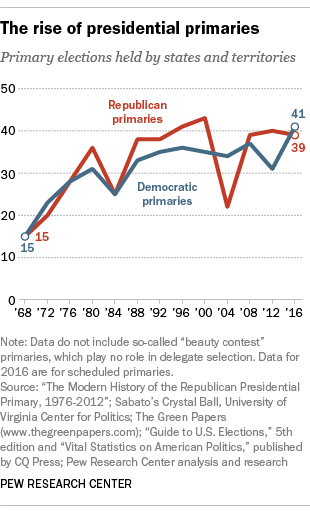 Candidates entered primaries largely to demonstrate their voter appeal, rather than win delegates: In 1968, for example, only 15 states held primaries, which together sent about 40% of the delegates to each party’s convention. That all changed after the Democrats’ chaotic, riot-marred 1968 convention, which nominated Hubert Humphrey even though he hadn’t competed in, much less won, a single primary. The Democratic Party revised its nominating process to broaden participation, lessen the influence of state and local party leaders, and try to make future conventions more representative of rank-and-file members. One important outcome of the post-1968 reforms is that nearly all convention delegates now are pledged to vote in accordance with the results of the primaries or caucuses that elected them (at least on the first ballot). With the power shifted away from the convention and toward the pre-convention contests, states began leapfrogging each other – seeking to boost their influence by holding their primaries earlier and earlier. In 1976, for example, it wasn’t until early May that more than half of the Democratic and Republican contests had been held. By 2008, that halfway point had moved up three months, to Feb. 5. On that “Super Tuesday,” Democrats held contests in 23 states and territories, Republicans in 20. In both parties, several states defied party rules and scheduled votes even earlier than they were supposed to, losing delegate seats as a result. The 2008 calendar was criticized both for being too front-loaded and for starting too early (the Iowa caucuses were on Jan. 3, and the New Hampshire primary five days later). Both parties have since changed their rules to push most primaries and caucuses into March or later (on the GOP side, for instance, states can’t hold high-profile winner-take-all contests, in which the top vote-getter gains all a state’s delegates, until March 15). This year’s Super Tuesday falls on March 1, when 13 states and one territory (American Samoa) will vote.